Steve Wood, manager of Danny Wright, believes the unbeaten light-welterweight will have a major impact on the domestic title scene with just a couple more victories under his belt. Wright is currently 9-0 (4), as he heads into a September 15th outing at Manchester’s Victoria Warehouse against Hungary’s Zoltan Szabo, 25-12 (11), which will be streamed live on vipboxing.tv. And Wood, who has guided countless fighters to title successes – most recently, Commonwealth Featherweight Champion, Ryan Doyle – is convinced the Failsworth fighter will add more titles to the VIP Promotions’ ‘Hall of Fame’. “Danny has been pro for a couple of years and breezed his apprenticeship,” said Wood from his VIP Promotions’ Astley base. “We’ll be stepping him up this season though and I’m sure he’ll rise to the challenge and put in some big performances. He’s in against Szabo for this first show, who should provide a solid test, because he has a lot of experience and can punch a bit himself. Wright – a decorated England international who was both a junior and senior ABA champ – says he is hoping to face a real test this year, before gate-crashing the domestic rankings. The 22-year-old acknowledges the UK light-welterweight division is thriving, but believes the Commonwealth and English Titles are already within his capabilities. “I’m happy to be steered by my team, but I’d love to get the English Title,” said the full-time fighter. “I’m feeling confident this season will bring a title. It’s just about taking opportunities as they come. “Light-welter is very competitive at domestic level. You’ve got Sam Maxwell coming from the GB Squad who is at a similar stage of his career to me. Above that you’ve got Jack Catterall, Ohara Davies, Josh Taylor – so there’s a lot of talent at the weight. I’m young still and have got plenty of time to get to that level and into the mix. “I don’t think I’m far off the likes of [Commonwealth Champion] Glenn Foot or Sam O’Maison [English Champion] though. I just need a few testing fights because I’ve not been in one as a pro. I’ve been walking through everyone put in front of me, and not even dropped a round yet. So, I just need to come though a good test and then I think I could fight either of them, and I’m confident I’d beat them. 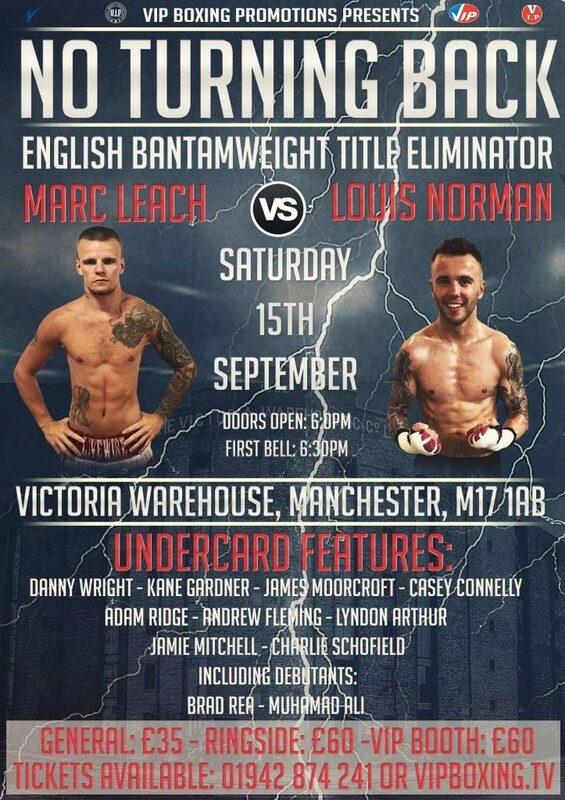 VIP Promotions presents Salford’s Marc Leach against Leicestershire’s Louis Norman in an English Bantamweight Title eliminator on September 15 at Manchester’s Victoria Warehouse. Appearing on the undercard will be Stretford’s Bradley Rea; Failsworth’s Danny Wright; Beswick’s Kane Gardner; Wigan’s James Moorcroft, Andrew Fleming and Casey Connelly; Leigh’s Adam Ridge; Blackpool’s Jamie Mitchell; Moston’s Lyndon Arthur; Bolton’s Muhammad Ali, and Ashton under Lyne’s Charlie Schofield. Ticket info are priced at £35 (General), £60 (Ringside), and £60 (VIP Booth) – please call 01942 874 241 or visit vipboxing.tv. Exciting Stretford prospect Bradley Rea has linked up with VIP Promotions, following the likes of IBF World Featherweight Champion Josh Warrington, and former world lightweight ruler Terry Flanagan, by joining the talent-rich stable. 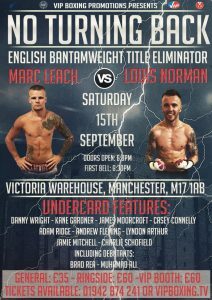 The 20-year-old debuts at Manchester’s Victoria Warehouse on September 15, on a card topped by Salford’s Marc Leach against Leicestershire’s Louis Norman in an English Title eliminator. With the show – streamed live on vipboxing.tv – just weeks away, Rea, a former Junior ABA Champ and England international, has already set his sights on a Lonsdale Belt as the minimum of what he wants to achieve in his pro career. “I’m over the moon to be with VIP,” said Rea, who boxed for St Johns ABC in Chorlton, a club run by his father. “I’ve been going to VIP shows since I was a kid, and the Victoria Warehouse is just around the corner from me. It’s great to be a part of the stable. I did have a few options, but I’ve seen what Steve [Wood] has done with some of the fighters he’s had, and I think he’s the best man to get me where I want to go. All the signs are that Bradley, who is trained by Blaine Younis from Ricky Hatton’s Hyde-based gym, should hit the ground running in the paid game. Dedicating himself full-time to his new career, Rea says he was constantly told during his unpaid days that he had a pro style, and believes he already has the versatility to adapt in the ring. “I’m quite tall for a middleweight, six foot three, but I do like to fight inside. If I have to box at range then I’m happy to do it, but if I need to have a dust-up then I’m happy to do that too. I can switch hit, and I’ve always been told I fight like a pro. So, I definitely feel I’m going to be suited to it.